I have Ubuntu 12.04 installed through Wubi on my laptop. For some reason when i click on Ubuntu on start up (when you have to either select windows or Ubuntu) I get the following screen, the grub cursor keeps flashing. command completions. Anywhere else tab lists possible device or file completions. Could you tell me what I can do to fix this problem and to start Ubuntu normally? Sometimes the root.disk, the virtual partition that Wubi uses to boot, gets corrupted. This is a file that lives in the \ubuntu\disks\ directory. If Grub (inside wubildr) cannot mount the root.disk, it cannot show the grub menu (which is stored on the root.disk) and then it just drops you to a grub prompt to await further instruction. There is nothing you can do from the grub prompt until you've figured out the problem with the root.disk and, odds are, there is NTFS corruption. It's fairly common, for example, if you've performed a hard shutdown or reboot. In some cases, the reason isn't clear. 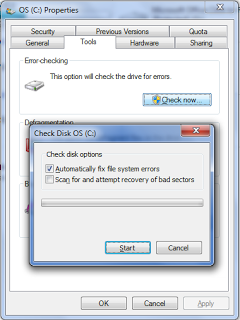 What you need to do is to run chkdsk /f (or /r) from Windows on the drive you installed Wubi. If you installed on the C:\ drive this will require a full restart. If prompted, restart the computer and boot into Windows to complete the chkdsk making sure not to 'Hit a key' to abort it. After that, check the ubuntu\disks\ directory to make sure the root.disk is still there. In some cases, the ubuntu\disks\ directory itself is no longer present. If either are missing, you need to look for them as chkdsk will often recover corrupted files/directories to hidden folders named \found.000, \found.001 etc. These are hidden and protected OS directories by default (Windows 7) so they won't show up in Explorer. I find it easiest just to use the Command prompt. To do this, right-click on CMD.EXE and select "Run as administrator". Change to the drive the \ubuntu directory is located on, and search for the hidden \found.??? directories. 19/10/2012  04:51 PM    <DIR>          . 19/10/2012  04:51 PM    <DIR>          ..
Recovery isn't guaranteed in all cases depending on the extent of corruption. Note that the root.disk may be correctly in place before running chkdsk and then be removed after running it. The first line sets the partition that the root filesystem is on. The second line tells GRUB the location of the kernel you want to use. Start typing /boot/vmli, and then use tab-completion to fill in the rest. Type root=/dev/sdX to set the location of the root filesystem. Yes, this seems redundant, but if you leave this out you'll get a kernel panic. How do you know the correct partition? hd0,1 = /dev/sda1. hd1,1 = /dev/sdb1. hd3,2 = /dev/sdd2. I think you can extrapolate the rest. The third line sets the initrd file, which must be the same version number as the kernel. The fourth line boots your system. Not the answer you're looking for? Browse other questions tagged 12.04 wubi startup grubrescue or ask your own question. How to get past Grub prompt during boot? Ubuntu/win 7 dual boot only boots to minimal grub prompt? Im stuck at grub menu and cant boot to Ubuntu!